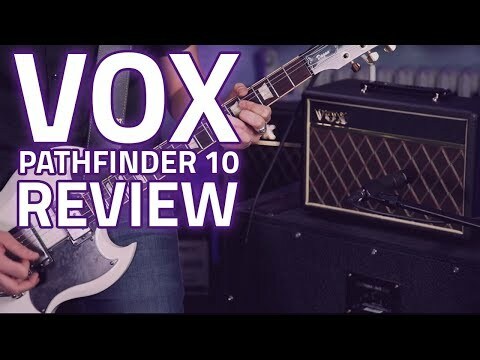 The Vox Pathfinder 10 is a 10-Watt, 1 x 6.5" solid-state combo amplifier that is perfectly sized for home practice and rehearsal in a small .. The Vox Pathfinder 10 is a 10-Watt, 1 x 6.5" solid-state combo amplifier that is perfectly sized for home practice and rehearsal in a small room environment. 2 band EQ, gain and tone controls on the top panel allow you to shape and control your tone to your liking, making it an affordable solution to tweak and experiment with sounds for use on a live stage or studio set-up. The Pathfinder 10s eye-catching looks are also classic VOX and include basket-weave, leather-look vinyl, our distinctive diamond grille cloth and, of course, chicken head knobs! Small but all-important details such as gold beading and white piping have also been faithfully reproduced, perfectly recapturing the legendary look of VOX.